Despite being torn by the idea of more chocolate-scented eyeshadows - in cute heart packaging, to boot - I had made up my mind to skip the Too Faced Chocolate Bon Bons Palette and wait for their Sweet Peach palette instead. But it was among my Christmas prezzies. Far be it from me to look a gift palette in the mouth. This is the third chocolate-themed eyeshadow palette from Too Faced. Their Chocolate Bar (reviewed here) and the Semi-Sweet Chocolate Bar (reviewed here) palettes are firm favourites of mine, especially the caramel-hued Semi-Sweet Palette. 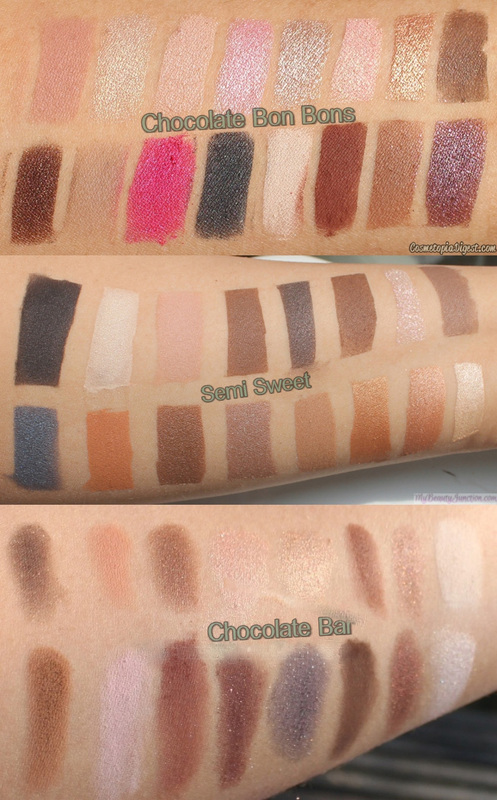 Scroll down for a closer look at the Too Faced Chocolate Bon Bons Eyeshadow Palette and comparisons with the Semi-Sweet and original Chocolate Bar palettes. Chocolate Bon Bons comes in a pink tin case and the pans are heart-shaped. And no, it does not look juvenile in real life - I thought it would, but it does not. The packaging makes it an ideal gift for Valentine's Day. As with the previous two palettes, this contains 16 eyeshadows, mostly neutral hues - four mattes - with a pop of colour thrown in. The shadows smell of delicious chocolate, and are infused with cocoa powder. I'll talk about pigmentation in a minute. Let's have a look at the swatches first. In direct sunlight, on bare, dry skin. From left, row 1: Almond Truffle, Satin Sheets, Cashew Chew, Cotton Candy, Cafe Au Lait, Sprinkles, Molasses Chip, Malted. Row 2: Dark Truffle, Pecan Praline, Totally Fetch, Earl Grey, Divinity, Bordeaux, Mocha and Black Currant. 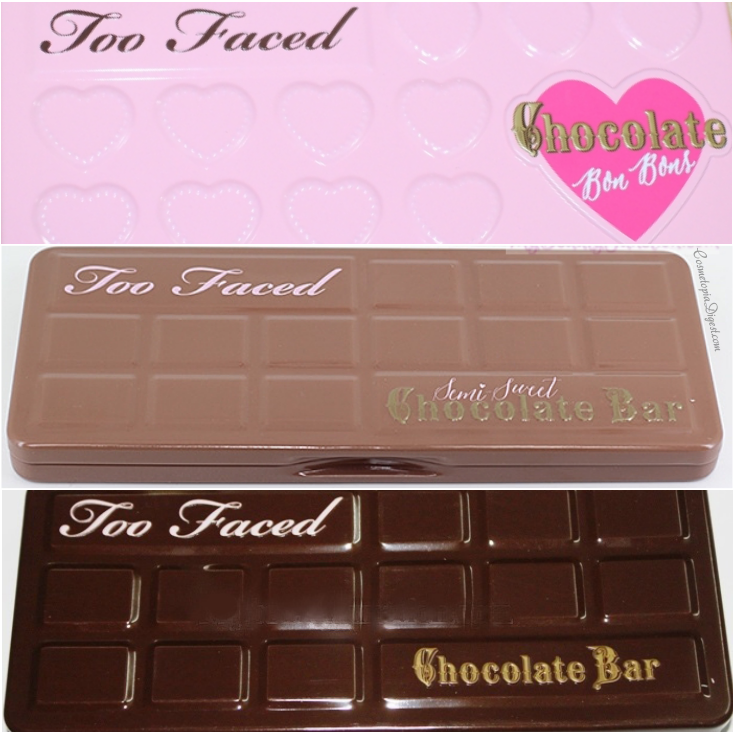 Of the three Chocolate-themed palettes from Too Faced so far, I feel this has the best consistency. I can use ALL the shades and don't have complaints about any of them being sheer, which is rare for me. I admit I had my doubts about Cotton Candy but it doesn't look garish on me. Black Currant, Cafe Au Lait, Bordeaux and Totally Fetch are standouts, aren't they? I have not managed to flaunt these shadows in public yet; all I've done is wear them on the eyelids through the day and look glum - without any face makeup. I have a review with my derm late next week and hopefully the embargo on makeup will be lifted. 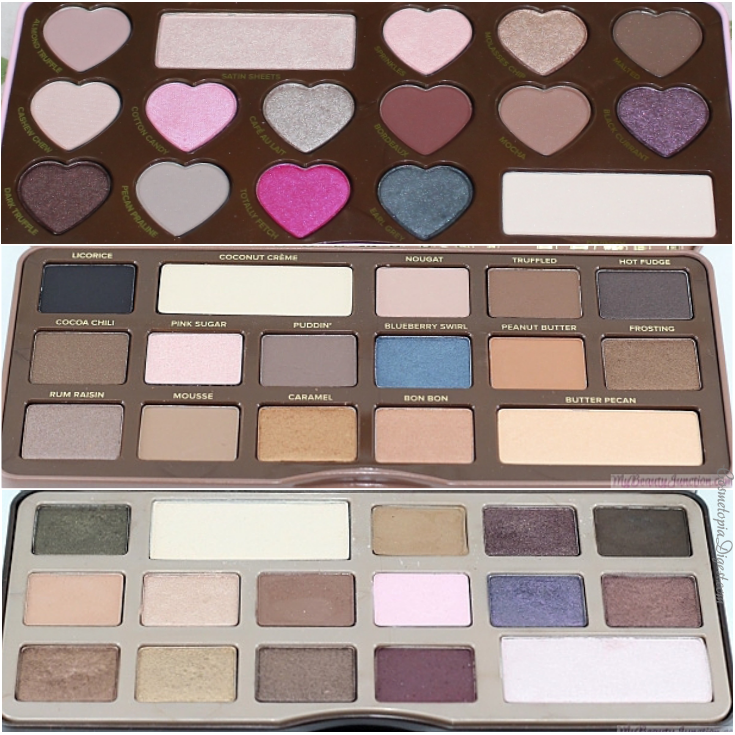 Which Chocolate palette from Too Faced? You have to love the packaging of all three - the original was a dark chocolate bar. Semi-Sweet came in a milk chocolate bar tin. Chocolate Bon Bons is a heart-shaped pink confectionery tin. Some shades inside do look similar at once glance. Mocha, Satin Sheets, Sprinkles and Malted in Chocolate Bon Bons look particularly similar to some of the shades in the other two palettes. But there is more overlap between the original Chocolate Bar and Semi-Sweet than between the Chocolate Bon Bons, which actually has more transition/lighter shades than the other two. Formula- and colour-wise, I would rate Chocolate Bon Bons above the first Chocolate Bar palette. There is more versatility and not one shade that performed badly. The first palette had one shade I could not use (Strawberry Bon Bon, a chalky milky pink), and was a tad more brown-centric. However, I prefer the equally well-pigmented Semi-Sweet palette over this by a thin margin, because caramel shades! If you like caramel and orange, go for Semi-Sweet, those are my kind of shades. It had just the one shade I could not use - Pink Sugar, which was chunky glitter and too pale for me. What's not to like about Too Faced Chocolate Bon Bons? The only question is whether you already have a large stash of neutral palettes. I like the shades in Bon Bons more than the ones in the original Chocolate Bar, though, as I said, the caramel neutrals in Semi-Sweet appeal more to me, but that is subjective. Too Faced Chocolate Bon Bons Eyeshadow Palette is available for $49 (same price as the other two palettes) at Ulta here and Macy's here (ships worldwide). Semi-Sweet is available at Sephora here and Macy's here. The original Chocolate Bar palette is available at Sephora here and Beautylish here (ships worldwide). Which one will you pick? All, none or one? Now to sit back and await the Sweet Peach palette from Too Faced in the Summer.